Best Floor Buffing Service in Lancaster, PA! ​Imagine a cleaner and healthier looking office space, where your customers feel invited and at home. With freshly buffed and waxed floors, your Retail, Restaurant, or Business space will welcome everyone in with a Sparkling first impression. Floor Buffing is one of many of our specialties in Lancaster, PA. Typically going along side stripping and waxing, buffing your floors brings out the beauty that is sealed beneath the dirt and grime. ​Our Floor Buffing Services in Lancaster, PA are offered for Commercial Properties at any hour of the day/night and begin at Competitive and Fair rates. Our team of Trained and Efficient Cleaners know how to get the job done promptly and correctly. 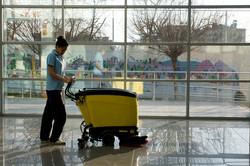 No more will your customers or clients walk into your building and see stains, dirt, and grime matted into the floors. Lancaster is home to many wonderful and beautifully crafted Businesses that not only pride themselves in Quality Services and Products, but in the presence they give to the public. If you are one of the many Businesses in Lancaster, PA that has pride in how the cleanliness of your building speaks for the Quality of your Business, then consider giving Lancaster Commercial Cleaning Service a call. We can make any dingy floor sparkle! Just call the Professionals or simply fill out the form on the right for a Free Estimate for Cleaning Services. For all of your Commercial Floor Buffing needs, you can count on Lancaster Commercial Cleaning 24 hours a day, 7 days a week.